At the turn of the last century, there were seven independent plantations cultivating approximately 10,000 acres of sugar cane in the Big Island's district of North Kohala. It takes a ton of water to produce one pound of refined sugar. Because of the drought that plagued the area at that time, some of the plantations were receiving only 15 to 25 inches of rain per year. As a result, yields were low, putting the plantations in financial jeopardy. The solution to the problem seemed simple: transport water from the verdant valleys, where rainfall averaged 150 to 300 inches a year, to the dry plains where the cane fields were located. Engineers evaluated the feasibility of such an irrigation system and recommended against it due to heavy rainfall, rough terrain and unstable soil conditions. Nevertheless, John Hind, one of the plantation owners, decided to proceed. He found an investor in Sam Parker, the grandson of John Parker (founder of Parker Ranch), who contributed about half of the $695,000 cost of the ditch. The balance of the money came from Hind and a few other entrepreneurs. The group retained M.M. O'Shaughnessy, a noted civil and hydraulic engineer, to design and oversee the construction of the system. O'Shaughnessy hired 600 men, most of whom were Japanese immigrants, and work began in 1905. At the 1,050-foot elevation -- in often cold, wet, windy conditions -- the laborers used dynamite, picks, shovels, hammers, chisels and their bare hands to painstakingly dig an average of 350 feet through the mountains each 12-hour workday. They lined the tunnels' walls with hand-cut rock and grout, and stabilized the ceilings with concrete. 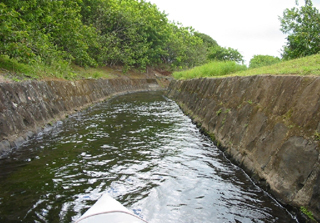 When it was completed, the Kohala Ditch was hailed as an engineering marvel and received widespread acclaim. You may have heard that flumin' da ditch on the big island had to shut down for safety reasons after the earthquake last year. There are no definite dates to reopen the canals which sustained damage in the 2006 earthquake, so if you must go flumin’, you need to visit Kauai to go flumin' the old school way. Kauai Backcountry Adventures (who also operates a zipline) has a mountain tubing adventure which is more like local kids did it back in the day. 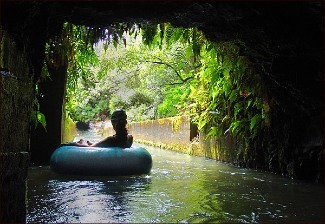 That means you'll hop on your very own tube to float down the irrigation canals of the lihue plantation. 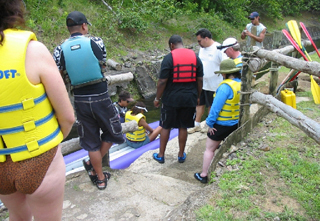 The three hour tour provides ocean and mountain views and a picnic lunch when you arrive at a quaint swimming hole. This a low key & family friendly adventure so don't expect an adrenaline rush from raging waters.